Greenfield Council members (l-r) Chris Borreson, Phil Clyburn, Bob Bergstrom, Eric Borsini and Mark Clyburn are pictured at Tuesday’s meeting. City Manager Todd Wilkin and Finance Director Carolyn Snodgrass are pictured to the left. The operation of Mitchell Park was discussed at Tuesday’s Greenfield Council meeting, including the building of new dugouts and how the park is managed. City manager Todd Wilkin suggested in his report that council consider the park being run by an association rather than solely by the village. Currently, Mitchell Park is under the governance of the village through the recreation commission, which oversees all park areas of Greenfield that also includes Felson Park and a bike trail. He said at a recent meeting of the commission the “consensus” of the group was that an association needs to run the park and the ball programs. An association, Wilkin said, would be able to handle the money aspect, comprise a more standardized set of rules for league play, and field all questions and complaints, rather than those issues coming to the village offices. And, it would also be better able to gauge what, if any, changes would help imbue new life into the programs. Council member Chris Borreson voiced concerns about the suggested changes due to the poverty of the area. He said the village has always tried to keep the ball program prices down so kids’ cost of participating would be less of a financial hardship on parents. Things like considering traveling as part of the league play could leave a lot of kids out, and Borreson said he doesn’t want that. The city manager agreed that the ball programs should be accessible to all youth. The bottom line, Wilkin said, is “the park is a great asset to the community.” He said he believes the park and the youth that play ball there would benefit from an association that could help revitalize the programs at the park. On a another matter relating to the city park, Wilkin said two dugouts have been taken down as part of a plan to build new, larger dugouts that will include storage space. The work is all being done by volunteers and all materials for the project have been donated, Wilkin reported in a previous meeting. In other business, council member Eric Borsini reported that GCTV has donated $20,000 to the village, which he said would be put toward two new police cruisers. Money that is coming in through contracts with other counties for Greenfield to house their inmates will take care of the rest of the cost of the cruisers, he said. Legislation seeing to the last bits of forming a building department was approved Tuesday. The measures stem from Ross County terminating its contract with Greenfield for such services earlier this year, but Wilkin has seen it as an opportunity for Greenfield to gain control of what happens in regard to building in the village. Ninety percent of permit fees will go to National Inspection Corporation, which will provide inspection services, with the other 10 percent going to Greenfield. Of that 10 percent, 3 percent will go to the state on commercial permits, and 1 percent for residential permits. Local events coming up in the next week include the Greenfield Historical Society’s 12th annual History Day on Saturday, Oct. 6 and the 14th annual Ghost Walk on Monday Oct. 8, Wilkin reported. Saturday’s event kicks off with a 5K beginning at 9 a.m. with activities throughout the day. Monday’s event will begin at 6 p.m. in the Old Burying Grounds. Greenfield Village Council meets the first and third Tuesday of each month at 7:30 p.m. in the council chambers on the first floor of the City Building. All meetings are open to the public. 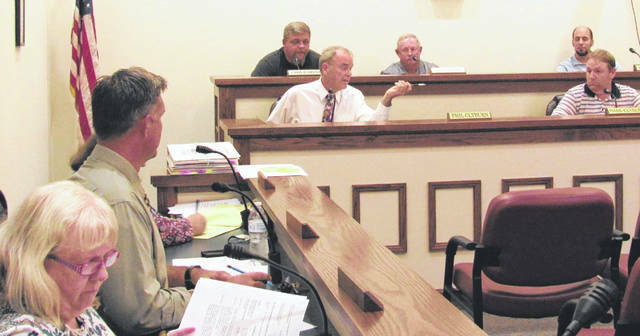 https://www.timesgazette.com/wp-content/uploads/sites/33/2018/10/web1_Greenfield-council.jpgGreenfield Council members (l-r) Chris Borreson, Phil Clyburn, Bob Bergstrom, Eric Borsini and Mark Clyburn are pictured at Tuesday’s meeting. City Manager Todd Wilkin and Finance Director Carolyn Snodgrass are pictured to the left.